Welcome to the CIO Podcast. We provide you with innovative topics for CIOs, IT managers, and entrepreneurs. You get tips about topics like IT strategy, digital transformation and decision support systems. My name is Petra Koch, I’m IT strategy and transformation adviser, and I’m happy that you decided to listen to us today. Please enjoy the podcast on your way to work, at the airplane or from where ever you listen to us. Have fun. In episode 23 of the CIO Podcast Petra Koch is talking with Prof. Dr. Falk Uebernickel about design thinking. Design Thinking is a method that can be used to develop customer-, user-, and human-centric products and services. 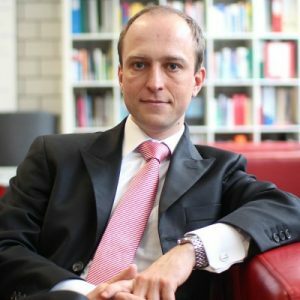 Prof. Dr. Falk Uebernickel is associate professor at the University of St.Gallen, one of Europe´s leading universities for Strategy and Management and Managing Partner of ITMP AG. He started his professional Design Thinking carrier with projects at a financial service provider in 2008. Furthermore, he is teaching Design Thinking at master student level together with Stanford University and is conducting executive lectures at companies. In between he worked for companies globally in various industries like banking, insurance, automotive, sports, pharmaceutical and more on over 80 projects. His focus is on training and teaching as well as strategic planning of transformation projects in companies. In his spare time he likes mountaineering, hiking and running. Since 2016 he is spokesman of the SUGAR network, which he founded 7 years ago. Sugar is a global network that brings together multidisciplinary students from different universities and challenges them to solve real world product development challenges. Professor Uebernickel’s personal mission is to have free education at a high level of quality throughout the world, that everyone has access to education, and that’s why he is personally engaged in different projects all over the world, especially in Africa, and he does that since one and a half years. Enjoy the interview. We are happy to receive your feedback! Which challenges do you see in corporations regarding customer centricity and innovation? Good question. I believe it depends on the industry and on your own perspective, how you look on these different industries. First of all, if you look, for example, to the manufacturing industry, there you have different challenges, like in the service sector. In the manufacturing industry, I usually observe the fact that user centricity was over the last couple of years part of the strategy, for sure. Nevertheless, it was more or less seen as a vehicle to communicate in a better way with the customer, but customer centricity was not really implemented into the R&D processes. This basically means that in the future this kind of industry needs to have a better focus on implementing methods and tools into their own R&D processes, and this is, from my point of view, one of the biggest challenges. Beside that, I also realize that the behavior and the own attitude of managers in that particular atmosphere need to change as well. In former times, especially in Germany and also in Switzerland and Austria, companies were focused on high quality products and their functionalities. This made them very successful over the last decades, nevertheless, nowadays not only the functionality counts and the quality of the product, but also the way how 00:04:00 a product fits into the life of people or fits into the life of the processes of their own customers. Managers have to change their own attitude and behavior towards a more customer centric management behavior. They need to let people do in their own organization stuff, and also they have to open the door for them to go out and to talk to the real customers, to the real clients and users of products in order to better understand what the needs are. In the service sector on the other hand, you have some of the same challenges, like the behavior, so managers also need to change their own perspective on customer centricity, which will take quite a long time. We have seen that in several cases in the past years that this kind of cultural change usually takes five, six, seven years, but they also have to look on how to design services with a much closer proximity to the users but also to the humans. What do I mean with focus on humans and not on users? There’s one good example, imagine the fact that have a Nike wristband for tracking your own motions and movements, and the goal of that application and use case is on one hand side to make you healthier, but on the other hand, they use gamification techniques to keep you engaged with the system. So more as you move and move yourself, you get bonus points and other kinds of gratifications in the system for this kind of movement and staying healthy. But for example, what happens if you get a disease? You get a cold and you cannot exercise and you cannot walk for a week or for two weeks, for example. Then the big problem is that inside 00:06:00 this application you don’t get the points anymore and you look like someone who is lazy and not engaged into sport and into moving around and staying healthy, but in fact you’re just having a disease. This results in– or it comes from a very specific look just on the user, but not on the human being because by designing today’s Nike service, the company was just looking from the company perspective to a human being, but not considering the entire context where that human being is living in. I think this is of utmost importance for service companies in the future to take this step forward, because some of them are already user centered, I would say, but they need to become human centered in the future which is another stage of development. These are beside other challenges like agility and taste to market, fit to market, I think, are one of the biggest one. You mentioned customer centricity as a key or human centricity as key, and design thinking is a method to expose the centricity to product. Why should IT managers and CIOs engage in design thinking projects with their organizations? First of all, just to make it clear in the interview, you have to differentiate three development stages. In the past we have- talking about customer centricity. Now we are in a age of user centricity, and tomorrow we will be on the age of human centricity, and this is in particular interesting if you look to the B2B business. In B2C, the customer and the user are usually the same person, because you for example, Petra, you take the buying decision and then later on you have the use that stuff what you bought. But in a B2B 00:08:00 situation, it’s completely different. There is someone sitting on top, a manager and purchasing manager, for example, and he or she takes a decision to buy something in regard to costs and quality and what so ever. But the user is someone completely different, and they might have completely different criterias to evaluate the product. Nowadays company are trying to shift from this customer orientation towards this user orientation, but in the future our belief is that companies have to go one step further to human centricity. Because if you just look on the user and on the use of the product or service, and you just take into consideration the direct interface between product and the user, but you usually don’t look to the concrete context of a human being, where he or she is living in and this is meant by human centricity. Human centricity is also trying to understand all the other environmental factors that influences a person and their behavior and also perspectives towards a service and product, and towards an organization. It’s creating more complex, more complicated problems but as I said with the Nike example before, it’s very important in the future to understand the differences, and to push your own organizations towards this human centric. From your point of view, what is the essential benefit of design thinking methods or design thinking projects? Here you need to understand what design thinking basically is. If you look on the level of principles and principle sets then design thinking is the art to act like 00:10:00 a designer but in any other discipline, business administration, engineering etcetera. One of the basic principles for designers is to go out to the customers, to the users and to the human beings, for sure, and to immerse yourself to this environment by talking to people, by observing them in order to gain empathy. I really want to mention that word again, empathy. This is something that needs to grow over time in people, in R&D people, for example, or people who are involved into product design, in order to design products that really fit into the people’s life. If you don’t have this empathy, and design thinking is helping you to gain this empathy, designing really good fitting products, people are really not able to understand what people need outside of the organizations in regard to products and services. So this is important to understand because this also means that you cannot delegate this activity of going outside the organization to someone else, like to a marketing agency or to other people in your organization, because the product development and service development team by themselves need to expose them in order to grow this empathy. It’s not possible by reading a 100 page report, you really have to be outside, and you have to immerse yourself to this environment. So that’s also probably a thing that people are not used to, right? Like an IT person is not used to going to the customer, right? It’s not only IT, it’s really anyone in the organization, and we have seen so many cases that- except sales. They usually have to go out, but except sales, any other function in your organization is usually not really exposed 00:12:00 to the customer, either because of restrictions, so they have rules in place that is not allowed to go out, or people are really not aware of that fact that it’s necessary to go out. It’s not only restricted to IT departments, it’s really affecting all the other departments. But still nowadays it gets more and more important for CIOs and IT managers to train their own staff, because when we talk about digitalization and the integration of IT technology into every service and product in the future, then IT needs to be part- really, this is essential, needs to be part of every project from the beginning on. Also all the IT employees that work in such a project need to gain empathy for the client as well. I mean, how can you design an application without knowing for whom you design that? Therefore, it would be a wise recommendation– well, it is a wise recommendation to train, as a CIO, your own workforce in design thinking. Yes. When you do that, what are the obstacles you may discover in corporations when it comes to using design thinking methods, or when you start projects with design thinking? This depends on the time. In the beginning, usually there is a healthy hesitance, I would say, in regard to this new approach. Everyone is looking at it and usually people have read some articles about it. They just read that design thinking is more or less a sticky process on walls and building silly prototypes. Therefore, the first challenge is to convince these people that design thinking is not just a 00:14:00 funny workshop approach, but a serious project methodology before we get problems. Usually what we do is we start lighthouse projects. They take between three to six months. Within these projects you can show your capability to deliver good results, and to demonstrate that this approach shows up with completely new results, and also that the workforce in your own organization is capable to run such a methodology by themselves. Because many talks and meetings I had were about the question, „Are my employees really capable to be innovative?“ Unfortunately, people asking me that question, because yes, they are. This is also shown by research that there are no existing creativity types. So this means everyone can be creative if you put them in the right environment and if you provide them with the right tools. Let me say one sentence. Yes, it might take with people who worked for 20 years with the traditional approach, it might take a couple of months until they changed. You have to give them time. It doesn’t take effect in hours, and this is maybe different to the younger generation, or with young people it sticks immediately. But with someone like me, who is close to 40, it might take a month or two. [laughs] But if you spend this time, and this is in a good investment in your own workforce, then it really pays off. You said design thinking is more a project methodology than going one or three workshops itself. 00:16:00 So I’ve learned or I’ve recognized that a lot of people think design thinking is a workshop-based method. How do you think about that? My perspective is it’s not a workshop-based method. I personally learned that entire approach at Stanford University, and I give, on a regular basis, lectures there as well. At least from this point of view, it isn’t a workshop. Yes, we do workshops, but workshops just for training people, but not for solving problems. When you look at the applications of design thinking in organizations, I usually differentiate three different problem categories. I differentiate in well-defined problems, in ill-defined problems and in wicked problems. For each of these three categories, you need different approaches. So easily explained, well-defined problems are problems where you know the solution and you know the paths for solving it. You solve these well-defined problems by using discipline methods, like waterfall method. You can have relatively big teams, large teams working on solving that problem and bringing the solution to the road. This makes up around 80% of your problems in your organization. Then you have ill-define problems. There you know the solutions, but you don’t know the path towards the solution. For these particular problems, you usually use HI methodologies. One of them is scrum. Therefore in scrum, for example, you need to have a product owner that knows exactly what the product specifications are, and then you use a scrum to figure out the way how to realize these functions. This is around 10-15%, as I said. Then you have the third category 00:18:00 called wicked problems. Wicked problems are problems where you don’t know the solution and you don’t know the process. But as a manager you have a gut feeling that something needs to be changed in order to stay in competition. To a change in market environment widely called digitalization today, or it can also relate to internal problems where you need to automize work in your own production. For solving these wicked problems, it is proven that you should use methods from a human-centered design, and one HCD mehod is design thinking, for example. just to finish this, the goal is to decompose with design thinking wicked problems into either ill-defined or well-defined problems. Then you take the other approach to solve it. So as soon as you have solved the wicked problem with design thinking, you can now grab an ill-defined or well-defined problem, and then you tackle with another approach, this new problem. So basically you hand it over from a wicked problem, that you’ve tackled with the design thinking methodologies, over to an ill-defined or to a well-defined, probably usually have ill-defined, and then you take probably a trial method to take it further. Exactly. It helps you to decompose problems and therefore in design thinking, to solve wicked problems you really need only three to five people. But very intelligent, very curious people, people who can dance with ambiguity and projects, and people who can gain empathy really quickly with human beings. Then as soon as you have solved the wicked problem, you hand it over to another approach, for example, the HI approach, and then you tackle this new problem or new problem 00:20:00 category with more people. This is also then very closely related to lean startup philosophy where you have these minimal viable products. So in the interface between wicked and ill-defined problems, you define a kind of MVP. What kind of setting is necessary to gain such kind of results and use designed thinking successfully? Good question. Not easy to answer because you have to look different settings. Before, we spoke about management and leadership, and for sure this is a huge success factor for projects that the management is open enough, curious enough and able to deal with ambiguity during the process and to delegate responsibility to the team. So if this is not taking part, if you just behave like with other traditional projects, then your design thinking projects will most likely fail. You have to give your team the freedom to decide and to choose their own paths. You hand over some type of responsibility to the team completely, right? Exactly. Not only to the team but much more also to the user and human, so to your future customer, because not the team decide so much on the solutions, but by testing prototypes very early in the process with users, together with users. The users are an essential part of the decision process, because if they reject a prototype then this means on one hand that you have to address your own assumptions that you put in the design process beforehand. It also means that the solution is not good enough 00:22:00, so you have to find another path and you have to find another solution that might fit or hopefully fit better to the customers and users needs. It’s not only handing over responsibility to the team, but also handing over responsibility to the market. You’ve mentioned earlier a couple of results like prototypes or better-defined projects or problem datement that comes out design thinking projects or design thinking processes. Design thinking operates at the intersection of business technology and people, could you point out some more results or typical resides of design thinking projects? On one hand side, you get real prototypes at the end of such a project. The prototype is something that’s a much better requirement specification, because you not only have documented requirement features, but also a tested version of your product or service in your hand. Beside this important result, you also get much deeper insights into people’s life and their own reasoning and into their behaviors. This is, I think, something that’s missing very often today that managers are not really aware about the needs of these users and customers in the market, and design thinking gives a very easy entrance for managers to get in touch with these. Furthermore, you get out insights. You learn a lot about your today’s customers and future customers, and this helps you to improve other solutions, accessing solutions in your organization too. By the end of each project, you’re employees are much smarter than before and really 00:24:00 quickly because they learn new thing about users, they learn new things about the possibilities to attack the market or to tackle the certain problems, and this grows a new culture of continuous learning in your organization too. This decreases frustration, increases motivation and curiosity. It is really interesting to see if you have worked in such a company. As you said, the aim of design thinking is basically or it was in the past to develop customer-centric, is currently to develop user-centric and will be to develop human-centric products and services. Which specific methods do you use in those projects and use them to generate such results? Overall seeing there’re definitely over 100 different tools and methods, so it’s not very easy. Maybe you can pick some out. Yes. Maybe let’s go through the basic design thinking cycle. We usually do and need finding and synthesis, so field research, then we do ideation, prototyping, testing, and defining the challenges. Tools we usually use– this is the kind of standard recipe but it needs to be customized for every specific project, but we use stakeholder maps, for example, we use qualitative interview, question guides, and definitely not questionnaires but question guides. We do a lot of field research in terms of observation techniques, we do interviews, the people one-on-one interviews, focus group interviews, dinner parties for conducting interviews. So there’s a big set of different interview and observation techniques, and also self-immersion sessions. Meaning that we do stuff by ourselvelf in the field. So we put 00:26:00 ourself into the shoes of our customers. Then we use several brainstorming and ideation techniques like brainstorming, brain-writing, power of 10 and many more. For prototyping, we do almost everything in a very basic version the so called low fidelity prototypes signaled out of paper and play dough, but as soon as we are more into the project and as soon as we better understood the market needs and user needs, we use methods like 3D printing, wire framing, we use applications like Prot app, for example to build quickly prototypes. There are plenty of tools and also programming frameworks, and then for testing we also have different testing techniques like a need finding as well, so we test the focus groups, we have one-on-one testing situations, as well as qualitative and quantitative methods. So those can be applied. It’s a big tool set, and you need to be a professional to pick the right tools at the right time. If a manager decides he wants to use design thinking in his organization, or he has a wicked problem that he needs to solve where he has the feeling that it’s good to take care of that, how can he or she establish design thinking effectively across his or her organization, and how does he or she find the right innovation team. How do you find the right people for that? A hard, difficult question maybe. The answer would be too long for this interview. But first of all, the manager, she did already the first step, which is good. So she’s curious, and she didn’t give up and she ceased the opportunity and this is the first and best starting point at all if someone in the management is 00:28:00 recognizing the situation and is curious enough to try out something new. But then to set up this transformation across is very effective. I think it’s good to run, first of all, a two or three lighthouse projects. I wouldn’t start with the big cultural change right from the beginning on, because as I said in the beginning, the hesitance against this approach is usually quite high, which also depends on the industry, although from my experience it’s quite high. Therefore, it’s wise to start with two, three lighthouse projects, and to demonstrate to all of the others in your organization that your own organization is capable to do it and that you can create new and valuable results out of this mehod. As soon as you have done this, and as soon as you have proven the applicability of this approach to your organization, I would start within transformation by design process, you do different things. So you do trainings in order to raise awareness about this approach. You coach more projects. You build a trainers internally and this is very analogue like in Six Sigmas, or you can have different belt levels. The black belt in design thinking is the super guru who knows everything about design thinking, for example. But also the organizational change needs to kickoff, because you have to be able to setup interdisciplinary teams. We didn’t speak so much about this during the interview but it’s crucial to have interdisciplinary teams working together in order to achieve these results and this requires also in many work times, organizational change, to get rid of the 00:30:00 very thick side of structures in the organisation. But as I said, it takes a very long time, or you have to plan in the beginning for this particular change and then you do this work for transformation and transition team. Is there something you can say regarding the lighthouse projects? Something that needs to be done to set them up correctly at the beginning or as something people should take care of when they think about starting the first lighthouse project? Yes, you can do a lot of failures at the beginning. One of the biggest failures is maybe to have a team in place that has not enough time to work on the project. So design thinking requires time. We spoke about all the field research that needs to be done, and this is really time-consuming. But my personal belief is that it’s also paying off. So it’s not a waste of time and waste of money. It’s really paying off, but you have to give people the time to spend on the project, which is usually two to three days per person, per week. This is very hard to get and to convince managers in the beginning. But usually they let them convince, and after the first project, they see all the benefits. Do you also need something like a fail fast mindset, or something like that? Because you said you’re working on prototyping methods. Good question. Yes, for sure. But the big question is usually, how can we make this happen? It sounds so obvious fail fast and earlier in order to succeed sooner. Many people talk about this. But in real life, it’s very hard to fail and not to look stupid. Yes, that’s true. People, especially in the German culture, probably, 00:32:00 have a tending not to do that. Exactly, because here unfortunately, but also in the US- it’s quite similar in the US too. Failures are not seen as a learning process, unfortunately. Therefore, design thinking is very iterative. We have very short cycle times, we call them design sprints. Within these design sprints, especially in the beginning in the first one or two, it doesn’t harm if you fail with your prototypes. I personally, if I coach teams, I put my focus on the fail prototypes in the beginning, because usually this failure arises from wrong assumptions that we put into the ideation and prototyping phase. By analyzing and reflecting on these failures, we get the chance to calibrate ourself to the market, and to better understand the users. Therefore this design thinking approach, because it’s so iterative and so quick and fast, it helps within the organisation to fail in order to learn, and not in order to being stupid. As you can imagine, if you would go run a waterfall project and you fail after three years, this is a big damage. Therefore usually these projects fail but people don’t say that they failed. They have a green mark at the end. Exactly. There’s always something good to tell about things. But here in design thinking, you can fail after months and you didn’t waist so much money. Therefore, it’s very easy to talk about it. Also the other benefit is, probably, that you won’t fail in three years because the product you designed is already adapted to the customer and the human needs. 00:34:00 Therefore for IT functions it’s a very natural approach, design thinking. Especially if they already have implemented agil methodologies, because they know how to iterate quickly. Usually they have super good preconditions, but they have to add a few more things to it in order to be ready for solving wicked problems, and not only ill-defined. If you can provide an advice to a CIO or IT manager, what would you say? You can also find a few advises when you have a couple. The first advice is stay curious and try it out. Without being curious and not trying out, you don’t learn. Then you are not able to judge on that approach. Therefore I would give the recommendation, apply silicon valley mentality, try out design thinking and draw your own conclusions after the first set of lighthouse projects. But don’t give up before. If not then read a book about design thinking or attend a workshop. You can not estimate what value comes out of a such a project in your organisation, if you haven’t tried it out yet. So be curious. Thanks, Professor Uebernickel, for the interview. It was a lot of fun to talk to you about that. Thanks a lot. For me too. Thank you, Petra. If you like the podcast, please take a minute to leave a review on iTunes! Thank you! You can find further episodes here.